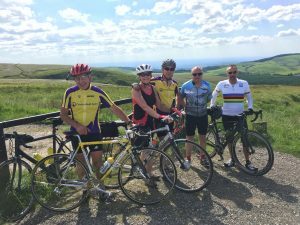 A journey to the Cat and Fiddle using the southern route was this year’s anniversary ride. Eight cyclists made the band of Spire souls taking up the challenge and these were Brian, Sue and Ian, Dave and Paul with James and Charles joining for part of the route. James is Sue and Ian’s son. James rode from Manchester to meet us at Lognor and then rode back to Manchester. The route set off from Queens Park and via Holmesfield, Owlerbar, Baslow, Ashford in the Water, Monyash, Longnor coffee shop, Flash, Wildboarclough, Cat and Fiddle Peak View cafe (Lunch) and returning on the River Wye trail with Beeley being the final climb. This was a challenging ride of 74miles and 7100 feet of climbing with a couple of 20% climbs and several 15% climbs thrown into the mix. The temperature did top 33 degrees C and the tarmac on the tops had melted – cleats sinking into the tarmac was a strange feeling. You may have expected the pace to be a little slow but this was not caused by the heat or climbs. The stalwart group of Spire cyclists were adamant that the herd of sheep and having to slow down for the Eroica cyclists was the cause. After lunch at the Peak View cafe the decent to Buxton was refreshing. The trail was quiet, the tunnels were cool and the closed Hassop Station cafe will always be remembered. The leather sofa’s outside the cafe caught our attention for 20 minutes before pushing on to the Beeley Climb. The final climb beat us and we parted to make our own journeys home.